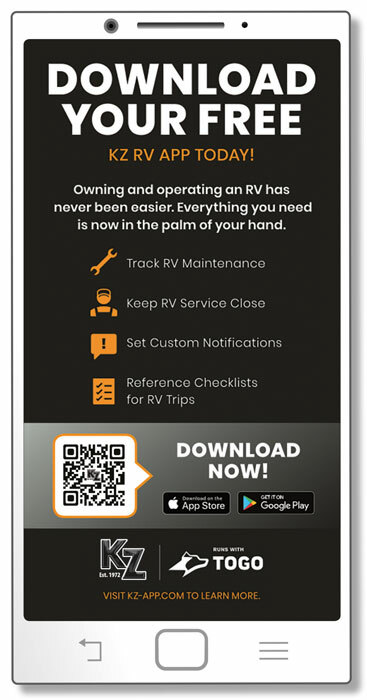 Powered by the TH2 technology company Togo, the KZ RV app ensures that owners get top-notch service, providing smart notifications for maintenance and ownership details like vehicle registration due dates, plus access to digital owners’ manuals and brand-specific updates. Checklists help with home departure as well as campsite arrival and departure. The KZ RV app also integrates with travel planning tool Roadtrippers, and peer-to-peer RV rental app Mighway. Future enhancements will include roadside assistance, how-to guides and more. The search for sticky notes and tattered folders is over; it’s all on your smartphone. KZ Recreational Vehicles, a subsidiary of Thor Industries, Inc., is headquartered in Shipshewana, Indiana, and was founded in 1972 on the principles of quality, fairness, courtesy and integrity. KZ produces several widely-recognized brands of recreational vehicles, including Classic, Connect, Durango, Escape, Sportsmen, Sportster, Venom, and Venture RV, including Sonic, Stratus and SportTrek. For more information concerning KZ and its product, please visit www.kz-rv.com and www.venture.com, or call (888) 829-6320.